We started out with a Village Marine Tec Little Wonder modular 200 water maker and found that support declined over the years and that the price for membranes increased significantly. With the power capacity that we have aboard I decided to build a new water maker using some parts from the original system, adding commercial off the shelf (non proprietary) components where possible, and increasing the hourly production from 8gph to 13gph. I initially replaced the DC motor and high pressure pump when I learned that VMT would not be able to provide replacement brushes for their motor. 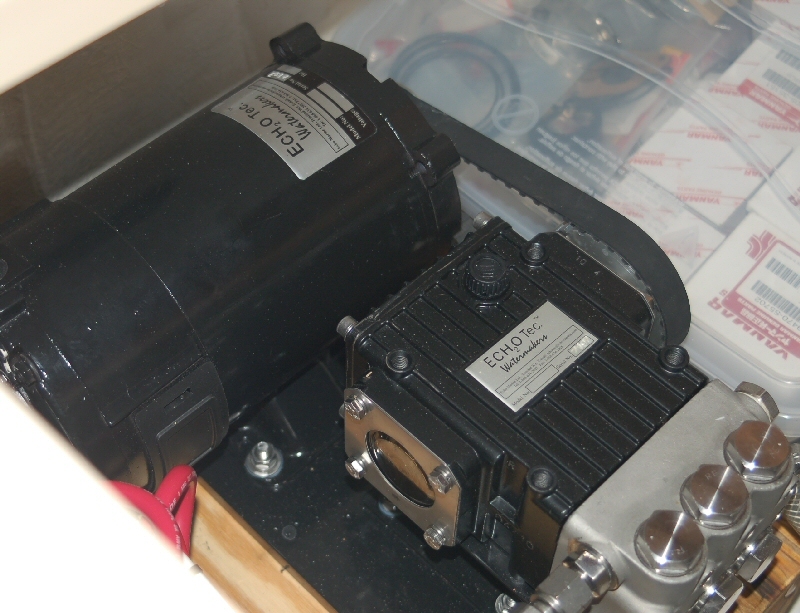 I bought a new pump and Motor from EchoTec and installed it in place of the VMT unit. So that I would not exceed the flow rate capability on the existing membranes the pump had to be run below full rated pressure so for the rest of the time on the boat in the Spring of 2011 I was still running at 8gph. 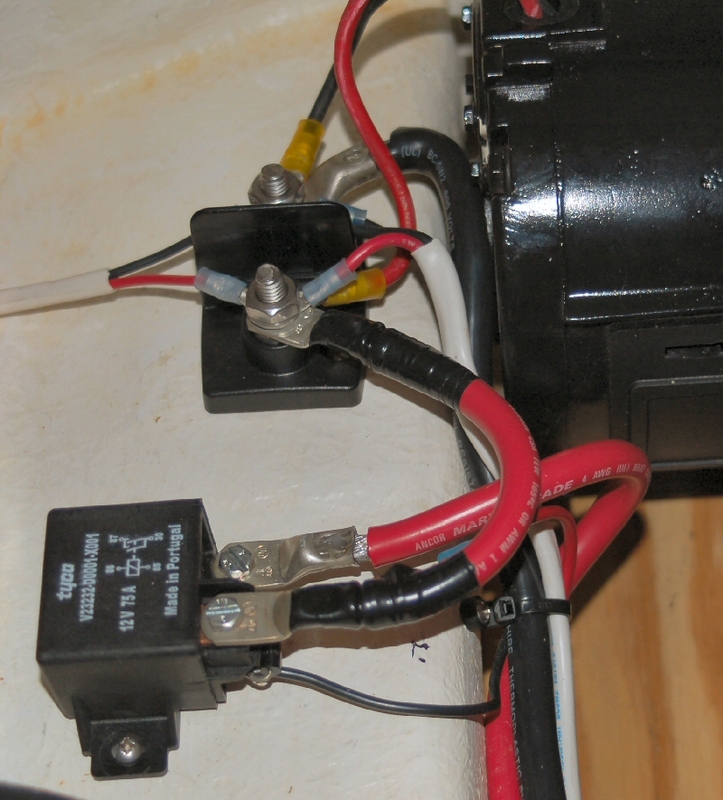 The new pump/motor fit in the same space on the boat and I rewired everything to accommodate the higher current requirements of the new motor. I planned to purchase a new single 40″ pressure vessel once we returned Florida for the summer and will install a commercial FILMTEC SW30-2540 membrane before returning to the boat later this year. The cost of the new pressure vessel and membrane is less than the cost of replacing just the membranes on the VMT unit. 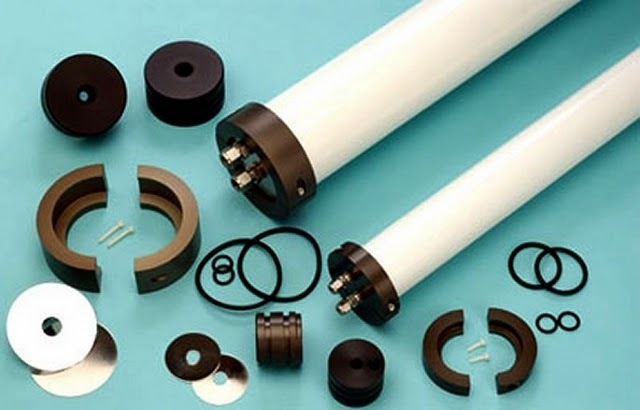 I chose a 2.5″ HCTI pressure vessel as it would have the smallest end-to-end dimensions of the vessels that I could find. The ports are standard 1/4″ NPT so I can use the high pressure fittings that I already have. The end caps on this pressure vessel should be much easier to change than were those on the older VMT system. The new pressure vessel with high pressure feed hose attached. I chose to use two 1/4″ high pressure street ells which adds only 1 ” on each end versus approximately 3″ on each end if I had chosen to go with the standard EchoTec fittings. This reduction in the total overall length of the pressure vessel/fittings was critical in my installation due to space constraints. I was able to salvage the old pressure regulator, pressure gauge and pressure valve and put everything back together using new HP stainless fittings and a new mounting bracket. 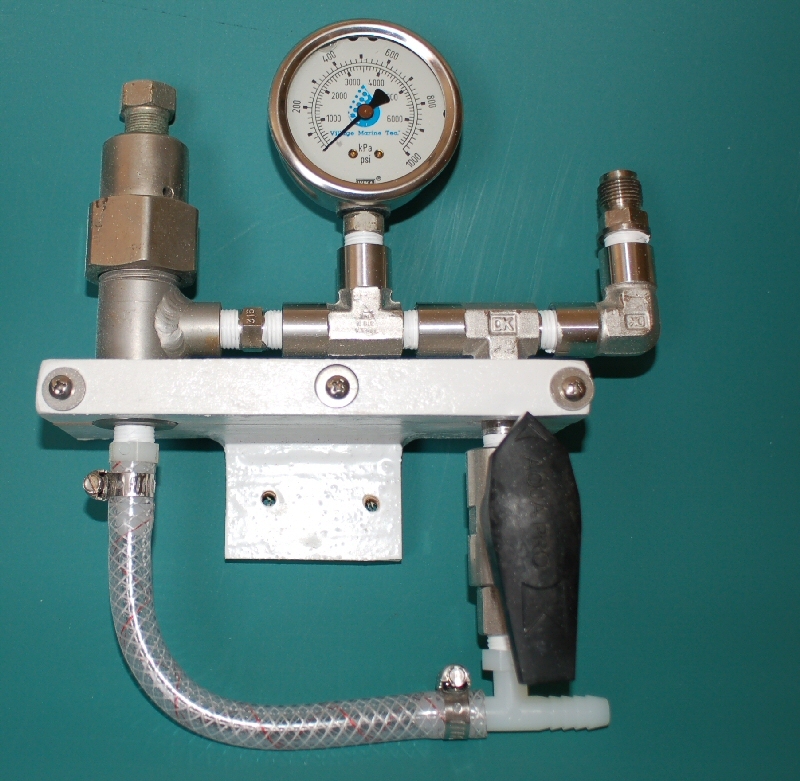 The pressure regulator (on the left) is preset to the upper pressure operating limit of the unit (850psi). The valve on the lower right is used to control sea water flow thru the pressure vessel. 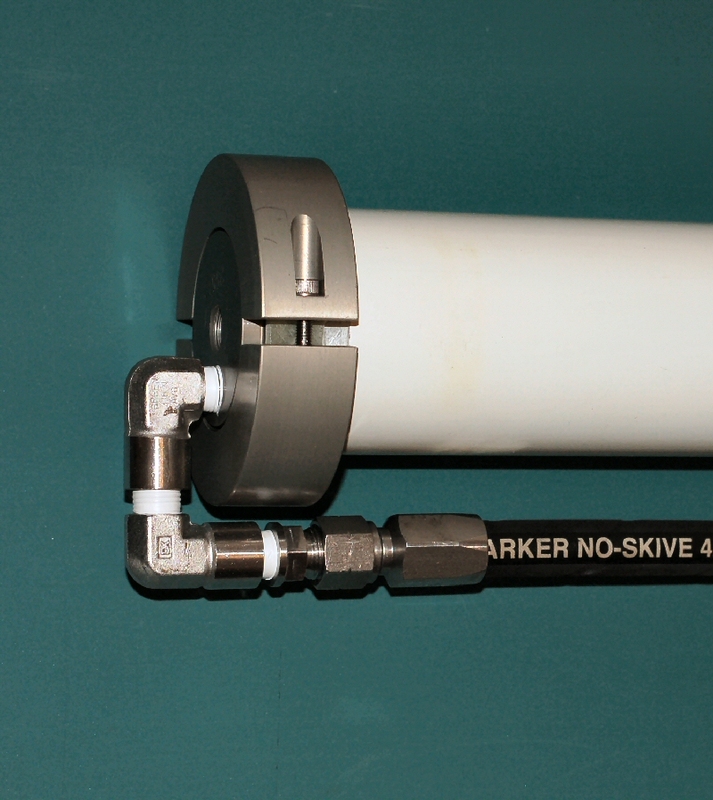 In the position shown, seawater from the pressure vessel discharge port is diverted at low pressure to the plastic hose barb tee and then overboard. When the valve is turned 90 degrees, sea water pressure builds to the 850 psi preset and excess applied seawater (brine discharge) runs out the bottom of the pressure regulator. The low pressure brine goes to the overboard discharge and product water begins to flow through the membrane. 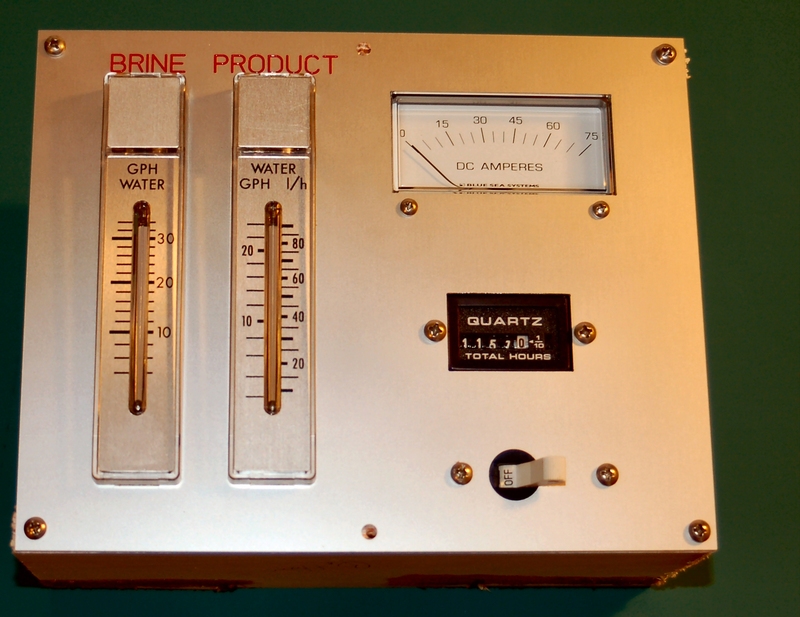 I built a new control panel that now will include the main DC power switch, hour meter, pump motor current, and the flow rates of both product water and reject brine. I designed the panel using a downloadable CAD application from Front Panel Express and then ordered the panel from them as well. We installed the new pressure vessel, membrane, all of the remaining parts and plumbing when we returned to the boat in December 2011. The new system is running at 825PSI with a product flow rate of 16GPH, very good flow, and the water quality is outstanding, less than 200ppm. When I took this photo I had not yet wired the ammeter shunt so no current flow is shown. 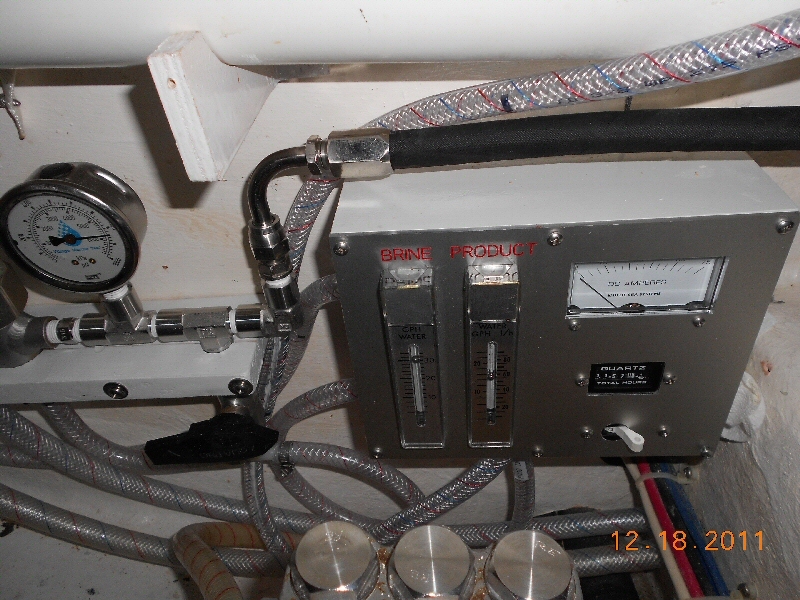 When we returned to the boat 2012 I replaced the brine flowmeter with one rated at 50GPH so that the reading is more near mid scale.